While the Nets are falling apart across the river in Brooklyn, everything seems to be finally coming together for the Knicks. The Knicks finally are starting to look comfortable in a triangle offense that previous seemed to be a cause of great confusion. 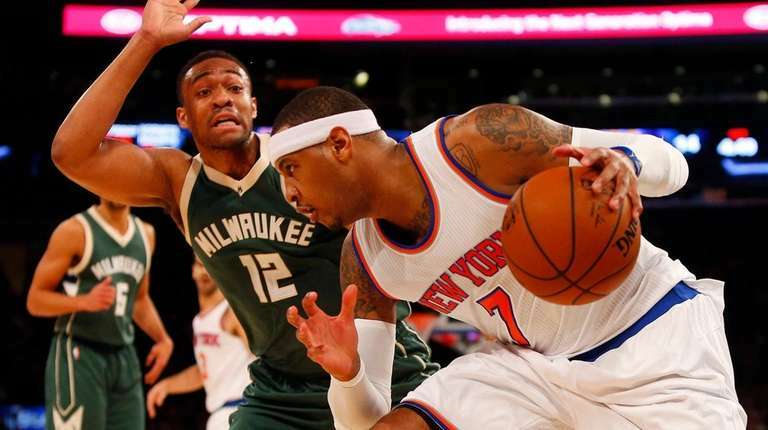 Fresh off an impressive road trip road trip in which they came one missed three-pointer away from going 4-0, the Knicks continued their momentum Sunday night, rolling over the Milwaukee Bucks, 100-88, at Madison Square Garden. The game was the Knicks fourth win in their last five games. It was also the first of an important stretch of winnable games, a stretch that could very well decide whether the team is headed toward the playoffs. Eleven of the Knicks’ next 16 games heading into the playoffs are at home. And coach Derek Fisher knows what kind of opportunity that presents. And he detailed his plans for building on it. Yet, there were a lot of fans at Sunday night’s game who seemed to think they were watching something important in the making, especially during the 14-4 run the Knicks went on at the end of the second quarter to take control of the game. Point guard Jose Calderon, who has missed a three-pointer at the buzzer against the San Antonio Spurs on Friday night, made some big contributions on the run, coming up with a key steal that led to a Carmelo Anthony layup and hitting a three-pointer that gave the Knicks a 48-39 lead with 2:24 left in the half. Kristaps Porzingis was a blocking and rebounding machine and even Derrick Williams got in on the action with a ferocious dunk that brought the fans to their feet and made the score 50-39. All told, five Knicks scored in double figures. Anthony fell just short of a triple double in the game, scoring 24 points with 10 rebounds and eight assists. Porzingis scored 15 points with six rebounds and five blocks. He also made the most impressive basket of the game, hitting a three pointer that was a good five feet beyond the arch to make the score 97-81. Greg Monroe led all scores with 28 points, while Khris Middleton added 20 points for the Bucks. Fisher said it’s hard to understate Anthony’s contributions. Bucks assistant coach Joe Prunty, who is acting as head coach while Jason Kidd is recovering from hip surgery, said he has been impressed with Anthony’s leadership on the floor. Fisher said he does see a new comfort level from his team out on the floor.